On Mar 30, 2019, the police and military killed 14 farmers in separate operations in the city of Canlaon and in the towns of Manjuyod and Sta. Catalina – all in Negros Oriental province. Twelve more were arrested. Police and military officials justified the killings and insisted that the victims were armed communist rebels. They claimed that state forces were just implementing search warrants for loose firearms when the victims opened fire at them. But several witnesses, including relatives of the victims who survived the gruesome killings, have come forward to dispute the account of the police and military. The harrowing details of the massacre as told by the survivors and kin are being documented by human rights advocates and peasant groups as calls for justice and to end impunity mount. The summary execution of 14 farmers in Negros Oriental came five months after unknown assailants massacred nine farmworkers in Sagay City in Negros Occidental on Oct 20, 2018. They were participating in a land occupation and cultivation campaign led by the National Federation of Sugar Workers (NFSW) at the disputed Hacienda Nene when they were killed. Weeks later, on Nov 7, 2018, their lawyer – a long-time peasant rights advocate in Negros – was also assassinated. For the military, the NFSW is a communist front. It came three months after six people were killed and 15 arrested in similar joint police and military operations in search of supposed loose firearms in hinterland barangays in Negros Oriental on Dec 27, 2018. Again, the authorities insisted that the victims, including village officials, “turned out” to be armed communist rebels and fought back. Negros island provinces are among those covered by Memorandum Order (MO) 32. It called for increased deployment of police and military forces purportedly to “suppress lawless violence and acts of terror”. The others are provinces in Samar island and Bicol region. Implementation of the Malacañang directive in Negros island has taken the form of the Synchronized Enhanced Managing of Police Operations (SEMPO). More notoriously, it is also known as Oplan Sauron in Negros Oriental under whose name the recent mass killings and arrests of mostly Negrense peasants are being carried out. Twenty of the reported 55 extrajudicial killings in Negros island were on account of Oplan Sauron in Negros Oriental. Oplan Sauron is sinister by design. Disguising as law enforcement, it uses search warrants for loose firearms to legitimize police and military attacks in rural communities and households suspected as bases of support of the New People’s Army (NPA). But instead of weakening the NPA, such brutal modus operandi could be fueling even deeper collective resentment in the rural areas against the police and military. In the end, Oplan Sauron could only further boost the legitimacy of the people’s war and agrarian revolution that the NPA wages. This is especially so because of the structural issues underlying the social unrest and conflict in Negros. Negros is an island mired in grinding poverty and hunger, mainly spawned by decades of chronic landlessness among its farmers and farmworkers. Official poverty and hunger incidence in the island, especially Negros Oriental, is among the worst in the country. Negros Oriental has a poverty incidence of 45% (of population) compared to the national average of 21.6 percent. Its subsistence incidence is 24.2% while the national average is 8.1 percent. Negros Occidental has “better” poverty and hunger figures (29% and 9.4%, respectively) but these are still worse than the national averages. The numbers are as of 2015. There are about 1.56 million poor people in the two Negros provinces. To give perspective, note that the country’s poorest region, the Autonomous Region in Muslim Mindanao (ARMM), has 1.99 million poor people spread in its five provinces. To be sure, the actual levels of poverty and hunger in the Negros island are much higher than what official data indicate considering the absurdly low thresholds government uses to measure them. Based on the 2015 official poverty survey, for instance, a Negrense only needs Php39 to Php44 to meet daily food needs; and a total of Php56 to Php63 to meet daily food and non-food needs. Many see government’s three-decade Comprehensive Agrarian Reform Program (CARP) as a failure; and it can’t be more conspicuous anywhere else than in Negros island. CARP is supposed to distribute 427,656 hectares (has.) of land in the Negros region. But as of end-2016, the program has distributed just 302,377 has. for a balance of 125,279 has. in land acquisition and distribution (LAD). Meanwhile, a sizable portion of CARP lands in the region, particularly in Negros Occidental, is under the notorious stock distribution option (SDO) that allows landlords to retain effective control. SDO schemes cover more than 3,200 hectares of CARP lands in Negros Occidental as of June 2015 and practically all are planted to sugarcane, accounting for almost 90% of all SDO lands nationwide. Indeed, most of the undistributed lands in Negros are vast sugarcane plantations concentrated in the hands of landlords that include political clans. After rice lands (about 23% of LAD balance), sugarcane lands (around 19%) comprise the largest portion of undistributed lands in the country, with an overwhelming concentration in Negros Occidental. Thus, many of the landless in Negros end up as sugarcane farmworkers in these massive haciendas, trying to eke out a living under slave-like conditions. It is estimated that Negros island has about 335,000 sugarcane farmworkers, almost 43% of the national total. Latest farm wages survey of government pegged the average nominal wage of sugarcane farmworkers at Php253.69 per day – the second lowest among major crops, just a bit better than corn farmworkers’ Php246.05. But the actual take home pay of the sugarcane farmworkers is much lower as they are tied to the vicious cycle of landlessness, starvation wages and debt. Paying off loans used to buy rice and other basic daily necessities in between pay days leaves sugarcane farmworkers and their families with practically nothing. In reality, a sugarcane farmworker typically earns just around Php50 to 67 a day, forcing them to work in several haciendas to augment their income. Their dire situation is only made worse by the dreaded tiempo muerto or the period between the planting and harvesting seasons of sugarcane where no work is available in the haciendas for three months. With no established mechanism of government support, sugarcane farmworkers are left to fend for themselves, usually by taking on odd jobs in the cities. But others take organized action such as the bungkalan campaign (land occupation and collective cultivation) on still undistributed CARP lands. However, landlords and even state forces respond to this legitimate form of assertion of people’s rights to land and livelihood with systematic violence like what happened in the “Sagay 9” massacre. Long before the drought and the Kidapawan bloodshed, hunger and poverty were already debilitating countless in the countryside. Along with fishermen (39.2%), poverty incidence is the worst among farmers (38.3%). In Region XII, site of the violence, poverty incidence among farmers is 47.9%, the fifth highest in the country. All cited data are as of 2012, the latest available from the Philippine Statistics Authority (PSA). For comparison, the 2012 national poverty incidence was pegged at 25.2 percent. Underlying peasant poverty is landlessness. A recent IBON article noted that: “Even the official census could only claim at most 62% of farms under full ownership. The rest are under various forms of land tenure, including tenancy at 15 percent.” The latest Census of Agriculture is 2012. Note that government’s poverty standards are ridiculously low and its data on land ownership questionable. Rural poverty and landlessness are thus much worse than what official data shows. Nonetheless, even distorted government data could not hide the dire situation that Filipino farmers face. Aggravating landlessness and all the feudal exploitation it brings are government policies and programs that devastate rural livelihood perhaps in a magnitude much worse than droughts or typhoons. Neoliberal restructuring brought in a flood of cheap agricultural imports that drowned local produce while commercializing vital infrastructure such as irrigation. So when calamities like drought strike, the already destitute farmers become even more despondent. Meanwhile, government negligence and inefficiency are further highlighted by its incapacity to respond as it has long abandoned its obligation to provide support services like irrigation and subsidies. All these combine to stir unrest in the countryside that has been long raging. Farmers become fighters in the agrarian revolution being waged by the New People’s Army (NPA). Or they barricade highways to force the powers that be to listen. But for a government of landlords and its armed forces, it makes no difference if you hold an M16 or a placard. The brutal dispersal in Kidapawan reminded us of the repression that farmers face when asserting their most fundamental right to live with dignity. Farmers, in fact, are not only the poorest – they are also the most repressed. According to human rights group Karapatan, more than 300 cases of extrajudicial killings have been recorded under the Aquino administration. More than 200 of these cases involve farmers. Before Kidapawan, there was Hacienda Luisita. And before it were Mendiola and Escalante. None have been resolved and the powerful people behind them become presidents and senators, feeding the reign of impunity and terror in the countryside. Some note that President Aquino remains silent on Kidapawan. But what do we really expect a landlord president will say? All these killings occurred in contexts of struggles and assertion of farmers’ rightful control over land and other resources for production against moneyed investors and landed families. 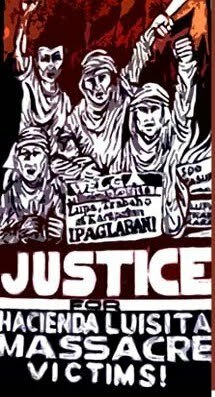 They illustrate that cases of atrocities against farmers like Kidapawan are not isolated incidents but a systematic repression of the people’s dissent by those few who wield power and arms. Already, the propaganda machine of the landlord regime is at full force in its disinformation and cover up. Propaganda and deception are part of its war against the farmers and the people. Indeed, the Kidapawan bloodshed is more than bureaucratic neglect as farmers go hungry. It is more than the police violating their own rules of engagement. In 2009, the Forbes magazine reported that the 40 richest Filipinos had a combined wealth of $22.4 billion. Last year, the amount more than doubled to $47.43 billion, amid deteriorating poverty and joblessness. What explains such rapid accumulation of wealth? The short and simple answer is that government, including the incumbent Aquino administration, has been creating the most favorable policy environment for big business. Indeed, Aquino’s apathy to the working class is matched only by his concern for big business. In fact, among the major commitments he made in his so-called Social Contract, creating favorable conditions for private business is the only promise that Aquino has been fulfilling. In particular, the administration is creating a conducive environment and providing more profit-making opportunities for big business through further privatization of infrastructure, utilities, social services and other vital sectors, or what is called public-private partnership (PPP). Aquino has also aggressively promoted extractive industries including foreign-dominated, export-oriented mining and oil and gas exploration that create social, development and ecological issues. He has been calling it “daang matuwid” but Aquino’s good governance campaign is more about instituting reforms to reduce business costs and risks than going after big-time plunderers like Mrs. Gloria Macapagal-Arroyo. His campaign to oust Renato Corona as Chief Justice of the Supreme Court (SC) was less about his supposed reform agenda but more about consolidating his control over the entire bureaucracy. Executive hegemony over government branches that make policies (Congress) and review the legality of such policies (Judiciary) creates an even more favorable political environment to push for retrogressive economic programs that favor certain big local businesses and their foreign partners. They include those who are closely associated with the Cojuangco-Aquino clan and are taking advantage of government’s centerpiece program, the PPP, as well as new contracts in mining and oil and gas exploration, among others. These big business interests are the same companies that have been expanding their economic empire by taking over, through PPP deals, infrastructure development in energy, telecommunications, transport, and water and storage in the past almost three decades. They include the Ayala family ($10.2 billion in investment commitments from 1984 to 2009); Lopez ($7.1 billion); Pangilinan ($5.3 billion); Razon ($3.2 billion); Aboitiz ($2.8 billion); Ang/Cojuangco of SMC ($2.6 billion); and Consunji ($1.1 billion). Aside from infrastructure and utilities, another major source of massive profits for the local elite and foreign corporations is the wanton extraction and exploitation of the country’s natural wealth; in particular the vast domestic reserves of mineral and energy resources. Three of Aquino’s closest businessmen-allies are already dominating the energy sector with power firms associated with Cojuangco, Aboitiz and Lopez controlling more than half of the national generating capacity. For sure, these families were able to increase their power portfolio even before Aquino became President. But under Aquino, they are enjoying even more opportunities for expansion as government implements the Electric Power Industry Reform Act (Epira) of 2001 even more aggressively. 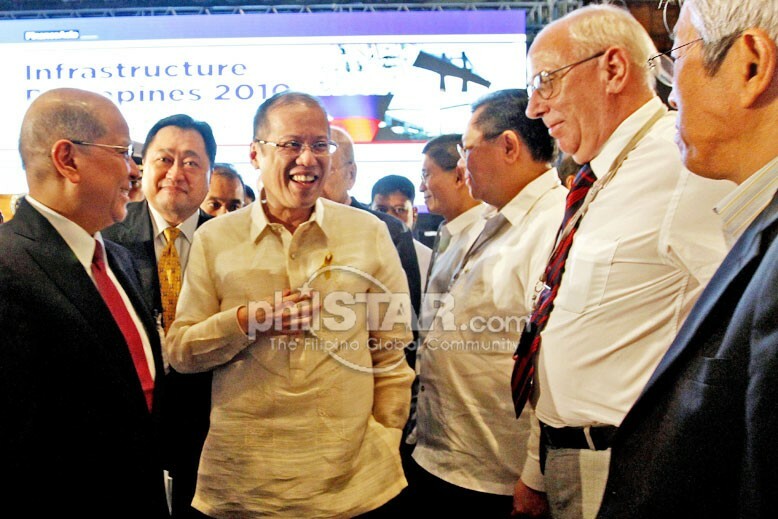 Aquino has made a strong pitch to fully implement the Epira in Mindanao, where Cojuangco and Aboitiz have pending coal-fired power plant projects and where private power operators are eyeing the privatization of the Agus-Pulangi hydropower complex. Meanwhile, it is estimated that some 24% of approved mining applications have been clinched in the first two years of the Aquino administration. As such, it’s not a coincidence that Cojuangco’s SMC has been on a buying spree of mining firms in the past two years. In 2011, it bought 10.1% stake in Australian firm Indophil Resources NL which owns 37.5% of Sagittarius Mines Inc. (the rest owned by Swiss firm Xstrata Copper), the operator of the estimated $5.9-billion Tampakan copper-gold project in South Cotabato – one of the world’s largest undeveloped sites. In 2010, SMC bought three coal mines in South Cotabato and Sultan Kudarat previously owned by Daguma Agro Minerals, Inc., Bonanza Energy Resources, Inc. and Sultan Energy Mining and Development Corp. But mining, while profitable, is also contentious and invites strong opposition from various sectors. Consistent with the deception of daang matuwid, Aquino recently issued Executive Order (EO) No. 79, which supposedly attends to concerns on environmental degradation and negligible economic benefits from mining. While the EO imposes a mining ban on 78 areas designated as ecotourism sites (including Palawan, apparently to appease Gina Lopez and co.) and a moratorium on new mining deals until Congress passes a new law that will increase government’s mining revenues, it will not stop controversial and greatly destructive mining projects such as SMC’s Tampakan. More significantly, Aquino does not intend to reorient the industry and reverse its liberalization the Mining Act of 1995. In his Social Contract, Aquino also promised to recognize farms and rural enterprises as vital to achieving food security and more equitable economic growth. In his PDP, he identified food security and increased rural incomes as among the major goals of government. Also, for agriculture to fulfill its role in reducing rural poverty and achieve food security in the long term, increased incomes, productivity and production shall be enhanced, according to the PDP. While government boasts of improving rice and food production, even claiming that the country may become self-sufficient in rice by next year, agriculture officials also admit that domestic agriculture remains very dependent favorable weather. But what make domestic food production especially vulnerable to adverse weather events are the accumulated effects of decades of neoliberal restructuring such as trade liberalization, land use conversion, promotion of export crops, etc. which aggravate the basic problems of backward agricultural system (one report said Philippine agriculture is among the least mechanized in Southeast Asia) and landlessness among the direct food producers. Alas, Aquino is not reversing these neoliberal policies much less implement genuine land reform. The dismantling of large haciendas for land distribution is not in Aquino’s agenda, which of course is not unexpected for someone who comes from one of the wealthiest and most influential landlord clans in the country. Last year, the Department of Agrarian Reform (DAR) was able to distribute just 113,196 hectares out of the already small target of 200,000 hectares, or an accomplishment rate of below 57 percent. DAR data also show that since taking over as President in July 2010, Aquino’s land acquisition and distribution (LAD) has averaged below 18,000 hectares a month – the second lowest among all post-Edsa administrations. As of yearend 2011, government still needs to acquire and distribute almost 962,000 hectares of land, which at its current LAD rate will be accomplished two to three years after the 2014 deadline set by the Comprehensive Agrarian Reform Program Extension with Reforms (Carper). Such lackluster performance in LAD is indicative of how the landlord President is indifferent to the plight of landless farmers. The Aquino family’s Hacienda Luisita remains a contentious target for land distribution despite the Supreme Court (SC) ruling, which revoked the stock distribution option (SDO) and ordered the transfer of the sprawling sugar estate to the direct control of farmers and farmworkers. Taking advantage of the basic flaws of Carper, the President himself is pushing for so-called “just compensation” that his family calculates at a staggering ₱10 billion – a further insult to the poor farmers who are the real owners of the hacienda. Instead of land reform and consistent with its bias for big corporations, the Aquino administration has been promoting projects that result in further displacement of farmers such as the case of almost 700,000 hectares of agricultural lands that foreign firms from the US, Europe, Middle East and others control (or will control) through agribusiness deals. And as mentioned, the PPP and mining projects that also grab lands away from tillers. Genuine land reform is indispensable if Aquino truly wants to increase rural income and reduce rural poverty like he stated in his Social Contract and PDP. As shown in previous studies, dismantling the land monopoly will generate an enormous amount of income and free up huge resources, in the process reducing poverty in the countryside where two out of three poor Filipinos live. Save for the official proclamation, the presidential elections is now over with Senator Benigno “Noynoy” Aquino III emerging victorious. Partial and unofficial tallies separately released by the Commission on Elections (Comelec) and its accredited poll watchdog Parish Pastoral Council for Responsible Voting (PPCRV) show Noynoy garnering at least 40 percent of the votes. The main message of the Aquino campaign, which apparently captured the sentiment of many Filipinos, is that the people are poor because of corrupt government leaders. Such message not only effectively depicted Noynoy as the anti-thesis of his despised and corrupt predecessor Mrs. Gloria Macapagal-Arroyo. It also underscored his only edge (i.e. lacking in competence and experience, he has at least a supposedly untarnished record) over his closest rivals in the presidential derby – convicted plunderer former President Joseph Estrada and Senator Manny Villar, whose presidential bid has been hounded from the start by, among others, the C5 corruption scandal. It remains to be seen if Noynoy can fulfill his campaign promise of immediately prosecuting Mrs. Arroyo and her cohorts for plundering the country with impunity and on a scale never before seen since the Marcos dictatorship. What is clear is that Noynoy and his handlers misled the people by asserting that without corruption, poverty will end. This point is crucial because it speaks a lot on what the Aquino presidency has to offer beyond prosecuting Mrs. Arroyo for massive corruption, specifically in terms of economic reforms that will benefit the poor and oppressed. Kung walang corrupt, walang mahirap? This basic premise of Noynoy’s advocacy conceals the structural roots of poverty. It hides the universal truth that the working people are poor because a very small minority monopolizes ownership over production means and the wealth society produces. It obscures the fact that as long as Aquino’s landlord family exerts effective control over Hacienda Luisita, the farmers and farm workers there will remain poor and their children will suffer even greater poverty even if Noynoy does not steal a single centavo from public coffers. “Hindi ako magnanakaw” was Aquino’s bold declaration, an assertion he repeatedly proclaimed in his political ads and rallies. But isn’t the exploitation of the farmers and farm workers of Hacienda Luisita pagnanakaw in its worst form? It may have been legitimized by his mom’s (late Pres. Cory) Comprehensive Agrarian Reform Program (CARP) and stock distribution option (SDO) but it is still pagnanakaw. Exploitation steals from the farmers and farm workers their due share of the wealth they themselves produce, and shackles them into perpetual and worsening poverty. If Noynoy’s vision is walang mahirap, what is needed is not only walang corrupt but more importantly, no Filipino farmer should be walang lupa. Currently, 7 out of 10 farmers are walang lupa and Noynoy must correct this age-old injustice by starting at his own backyard. Aquino, of course, promised to distribute the Hacienda Luisita by 2014, the deadline of the extended CARP. But almost half a century ago, his family also promised to distribute the contested landholding to its rightful owners – the farmers and farm workers. More than two decades ago, it was again promised by Pres. Cory. Fourteen people have already been killed in relation to the labor and agrarian dispute at the hacienda in the last five years, including seven who were massacred in November 2004. Why wait for 2014 when Noynoy, if he truly has the high moral ground compared to his opponents as he claims, can distribute the hacienda immediately? All he has to do is convince his family to withdraw the temporary restraining order (TRO) they sought from the Supreme Court (SC) that stopped farmers from revoking their devious SDO contract with Noynoy and his family. Unfortunately, Noynoy will not do that. In his first press conference after the May 10 polls, he reiterated that the Hacienda Luisita case is pending at the SC and he is respecting that process. Some have argued that Noynoy’s strong stance against Arroyo’s appointment of the next SC Chief Justice may have something to do with Hacienda Luisita, a contention that is not farfetched. It is simply not in Noynoy’s interest to give up the hacienda. While Hacienda Luisita makes him vulnerable to political attacks, it is still the material source of his and his family’s clout. The wanton plunder perpetrated by Mrs. Arroyo is only one of the great injustices that Filipinos suffer today. Corruption certainly aggravates the poverty of the people. While this must be addressed immediately and without compromise, the old and continuing social injustice bred by Hacienda Luisita and lack of genuine land reform must be addressed as urgently and as relentlessly. Government’s move to import duty-free 150,000 metric tons (MT) of sugar to supposedly mitigate soaring local prices may cause more harm than good for end-consumers as it encourages further speculation in supply and prices in the domestic market. The importation implies a situation of tight domestic supply and reliance on the world market where prices are skyrocketing. This provides more fertile ground for traders to exploit and further jack up local prices. However, what government does not mention is that while it is scrambling to import expensive sugar, it is also committed to export about 158,906 MT of sugar to the US this year under a quota system. Thus the simple question is: Why will we need to import to stabilize local supply and prices and yet export sugar to the US instead of ensuring our own needs? Historical sugar supply and demand in the Philippines clearly indicate that we do not face an actual deficit that could justify the price hikes. The only plausible explanation behind the sudden and steep hike in sugar prices is speculation and hoarding by traders who benefit most from high sugar prices. As of January 30, 2010, the prevailing retail price of refined sugar in Metro Manila is P54 per kilogram (kg) and brown (raw) sugar, P44, according to a price bulletin issued by the Bureau of Agricultural Statistics (BAS). For the whole January, the BAS has monitored five rounds of increase in sugar retail prices that hiked prices by a total of P8 per kg for refined and brown sugar. Sugar Regulatory Administration (SRA) head Raphael Coscolluela said that retail prices are increasing due to increasing mill gate buying price, which in turn is supposedly based on world prices. Global prices are increasing, on the other hand, because of a shortage of 9-13 million tons in the world market. For the last two years, Coscolluela explained that sugar production worldwide, including in the Philippines, had gone down due to bad weather, low prices, and high cost of inputs. Data from the Food and Agriculture Organization (FAO) show that the annual sugar price index in 2009 rose to 257.3 from 181.6 in 2008 and 143 in 2007. It rose sharply in the latter part of last year, reaching 334 in December from a monthly price index of only 177.5 in January and 233.1 in June. There is no justifiable reason for local sugar prices to increase due to increasing global prices. The Philippines is not highly dependent on imported sugar and in fact, is a net sugar exporter. Available production and consumption (or withdrawals, which also include those for export) data on raw and refined sugar covering crop years 1987-88 to 2008-09, as compiled by the Philippine Sugar Millers Association (PSMA), show that in 22 of these years, deficit in supply and demand/withdrawals occurred seven times – in 1994-1995, and from crop years 1996-97 to 2001-02. But of these seven instances of “shortage”, five can be considered artificial. Philippine sugar exports go to the US market under its Tariff Rate Quota (TRQ) system. This system sets the specified volume of raw cane sugar that the US will allow to enter its market at a relatively low tariff as part of its commitment under the World Trade Organization (WTO) Uruguay Round agreements. For 2010, the US Trade Representative (USTR) is allocating 142,160 metric tons raw value (MTRV) or about 158,906 MT of raw cane sugar to the Philippines. It is the third biggest allocation out of 40 countries (accounting for 12.7 percent of the total) granted with quota, behind only the Dominican Republic and Brazil, under the US’s TRQ system. Official data, however, also show that in the last crop year (2008-09), raw and refined sugar production declined by 3.56 million MT or about 13 percent. Another year of lower production this year due to the expected El Niño could put the country in a similar situation in the 1998-2000-period, government officials and industry players said. There is no official estimate yet on how big the impact of this year’s El Niño on the sugar industry will be. Large sugar players though are reporting production decline and anticipate further plunge. Victorias Milling, for instance, said that its production already fell by 18 percent last year and may again decline this year due to extreme weather events. Aside from El Niño, another source of pressure on local sugar production and supply is the competition from biofuels. The diversion of cane from sugar millers for the production of ethanol means less available sugar for the country’s food requirements. Republic Act (RA) 9367 or The Biofuels Act of 2006 mandated a 5-10 percent ethanol blend for gasoline products sold in the country. But at this point, everything is still speculative. And the best safeguard that we have against threat of lower production is not the importation of expensive sugar but an immediate halt to exportation, in particular to the US. This is justified by our food security interests. During the height of the global rice crisis in 2008, major rice exporters such as Thailand and India suspended exports. The SRA simply needs to fulfill its mandate of regulating sugar export to ensure domestic supply. For the surging prices, government must impose a price ceiling and not simply a suggested retail price (SRP). Sugar, as a basic necessity, is among the products covered by RA 7581 or the Price Act of 1992. At present, the government’s SRP of P54 per kilo reflects the massive speculation in sugar prices and thus unreasonable. The sugar imports, at best, could only bring down prices to a still inflated P48 per kilo. A more rational retail price should be about only P42 or the prevailing price in Metro Manila in the last week of November, based on the assumption that the steep increases in prices since December are speculative and not justified by the supply-demand balance and changes in production costs. This must be accompanied by a serious crackdown not on small retail outlets but on the largest private sugar traders that hoard supply. Another policy move in relation to supply should be the review of the biofuels program. RA 9367 itself provides for a review by the National Biofuel Board (NBB) of the supply of locally-sourced biofuel feedstock such as sugar cane and make necessary adjustments in the biofuel blend. Even before the recent surge in sugar prices, the local sugar industry could supply only about 79 percent of RA 9367’s minimum requirements (i.e. 5 percent ethanol blend). Surging food prices, on top of land reform and environmental issues, must pressure policymakers to reconsider the country’s biofuels program and correct a policy that further undermines local food production. Private traders, of course, want to take advantage of high global sugar prices and would rather export their commodity for larger profits. Or some commercial planters may want to sell their produce to ethanol plants that offer a bigger margin. Neoliberal thinking dictates that this must be allowed so that market forces can determine the best value of a commodity. But at the receiving end would be the ordinary people who will be forced to contend with high and increasing prices and at the same time the direct producers of sugar – the poor farm and factory workers – who continue to receive depressed wages amid soaring market prices. taliwas sa iyong akala ay di namin kinakalimutang maylupang panginoon. ay hindi kami magmamaang-maangang di namin batid. sa tunggaliang ito, hindi kami manlilimos ng iyong awa at atensyon. On Friday (May 22) afternoon, members of the House of Representatives’ (HoR) Special Action Force (SAF) and the Philippine National Police (PNP) violently demolished the temporary structures set up by farmers camping out of the HoR. The farmers were on the 40th day of the campout, which they set up to press lawmakers on the passage of House Bill (HB) 3059 or the Genuine Agrarian Reform Bill (GARB). I was there, with the other staff of Bayan, before the violent demolition took place. We rushed to the HoR after receiving word that there was a threat of demolition. When we arrived at past 12 noon, the farmers have started to voluntarily dismantle the temporary structures occupying one side of the main gate. Ka Paeng Mariano of Anakpawis and Ka Daning Ramos of the Kilusang Magbubukid ng Pilipinas (KMP) told us that it was in compliance with their agreement with the House’s security officials. The farmers would be allowed to maintain the campout on one side of the gate and hold a moving picket on the other side. When we left at around 1:30 PM, we had the impression that everything was settled. But as soon as we left, we received separate text messages from those at the campout that the SAF and police, backed up by a fire truck, have started to tear down the remaining structures on the other side. Gerry Corpuz of Pamalakaya later told me at the DAR (Department of Agrarian Reform) where the evicted farmers transferred, that they were able to defend the camp against the ruthless eviction by the SAF and police for about one and a-half hours. In its press conference this morning, the peasant leaders, some of the injured farmers and supporters, and Anakpawis representatives Ka Paeng and Joel Maglunsod strongly condemned the demolition. They pinned the blame directly on House Speaker Prospero Nograles and said House Secretary General Marilyn Yap, Sergeant-at-Arms Brig. Gen. Hortacio Lactao, Legislative Security Bureau (LSB) Isabelito Flores and the police and security guards must be held accountable for the violent eviction that injured 11 people. They will file charges before the Commission on Human Rights (CHR) and possibly before the United Nations Human Rights Council (UNCHR). At the DAR where I dropped by last night, the farmers and their supporters have started to rebuild their camp. Many of them were physically hurt, but there were no signs of dampened fighting spirit. One “manang” (elderly woman) was animated, repeatedly, tirelessly telling how she got her bruises and how she held her ground against the police. Gerry asked the designated cook that night to prepare dinner for at least 250 people. They were expecting six jeepneys to arrive from the provinces – reinforcing the farmers and supporters of genuine agrarian reform for the remaining days of the campout. Yes. The farmers and their supporters will be back on Monday at the main gate of the House. Undaunted, more determined.